There’s no such thing as a careless old backcountry skier. If you are reckless, careless, or even just fail to pay attention in the backcountry, you don’t get to be old unless the guardian angel on your shoulder is the size of King Kong. White Pine Touring, the part of Jans that does backcountry and Nordic skiing, has been leading backcountry tours since 1972. We’ve acquired a lot of knowledge and expertise over the past 40 years about what works, what’s safe, and what’s fun in the backcountry. Our objective is to pass that knowledge on to you so you can enjoy the magnificence out there and can be a client for a long, long time. Whether you’re just getting started and learning about backcountry safety, or you’ve been touring for years and need to replace specialty parts and gear, Jans has you covered. Our inventory of backcountry gear is tested and recommended by our Mountain Recreation Experts who are dedicated to getting you dialed in with equipment, clothing, and accessories for an unforgettable adventure whether your preference is for an AT set up (alpine touring), telemark skis, or a splitboard. We’ll start by pairing you with the right equipment that matches your terrain preferences and your skiing or riding style. Our experts will then provide you with custom boot fitting which is critically important to ensure that you’ll have the most comfortable backcountry experience possible, because what might be a slightly annoying boot-fit at the resort would become an unbearable situation hiking in the backcountry. As part of our commitment to the sport and to our clients’ safety, Jans and White Pine Touring support the education of all backcountry skiers and riders by offering multiple avalanche safety classes throughout the winter season. 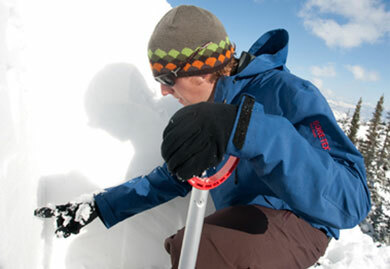 Our free seminars on avalanche awareness are introductory courses for people who have little or no backcountry experience. We also instruct Level 1 and Level 2 AIARE-certified courses for enthusiasts that want to push further into the depths of backcountry skiing and riding or pursue a career in backcountry guiding.